South Shore Realty has been a part of the Roanoke Valley since 1980 and remains a non-franchised real estate firm offering a full line of real estate services both at Lake Gaston and the surrounding area. Sandra Shearin acquired South Shore in 1988 and in 2013 was voted “Realtor of the Year” by the Roanoke Valley/Lake Gaston Board of Realtors. In 2014, Mike Gupton was recognized as South Shore’s Top Producer for nine years. Agents Liz Nielsen, Suzanne Prince, Pat Carroll and Jeff Wolgemuth are all Multi-Million Dollar producers. 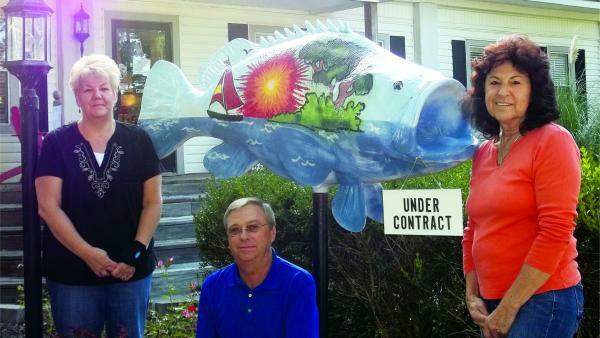 South Shore’s fish was designed and painted by artist Jim Ferrier (jnferr327@gmail.com), a Lake Gaston resident who used South Shore’s logo as inspiration. The fish, named Carpe Diem, was released on October 9, 2014 in front of South Shore’s Lake Gaston office. The phrase carpe diem is translated from Latin as "seize the day." Can you imagine a better place to seize the day than on Lake Gaston?